In my previous blog entry, I introduced the #NoFilter series which will explore some of the challenges and concerns pertaining to social media and its use in the library. For this post, let’s consider a topic that can be simultaneously fun and perplexing: generating quality content for social media! Thoughtful, consistent, and varied content is one of the keys to cultivating a meaningful social media presence for a library i.e., opening up channels of communication with patrons and encouraging enthusiasm for the library’s materials, services, and staff. Where does one look for social media content ideas? Keeping in mind that the intricacies of each platform necessitate different presentations in content, below are three suggestions for where those in charge of a library’s social media may find some inspiration. Image accompanying a Tumblr post about the behind-the-scenes process of evaluating donations at the Othmer Library. Behind-the-scenes – The day-to-day operations in a library may not seem like the most riveting subject matter for a social media post. However, in my experience, posts that feature behind-the-scenes work at the library often do very well. Think of it this way: isn’t it exciting when you get a sneak peek of what is to come or a look into processes with which you are not familiar? In terms of social media content, this could mean providing patrons with a photo of the library preparing to open, new acquisitions being processed, a book being repaired, a recent donation to the library still in boxes, a new addition being built, a new technology being installed, or a new fish tank being set up. For this type of content, consider consulting staff throughout the library such as those in technical services, collection development, or interlibrary loan. Not sure how a post about an ILL would look? Check out this great Instagram post from The Frick Collection. Reference Questions – What questions have the library staff recently answered for patrons or for one another? What information was unearthed? What resources were consulted? What steps were taken to track down an answer? You may want to consider working with reference staff to compose social media posts that not only share the findings of research, but also the research process. Chances are that such information will be of interest to others. Additionally, this type of post highlights the expertise and talents of library staff. Individuals who may never have thought to consult your library before on such topics may find themselves reconsidering after seeing your post. One example is this “From the Othmer Library Reference Desk” post on my library’s Tumblr. Events – Event-driven content is one of the most commonly employed on institutional social media outlets. There is an event coming up (e.g., an open house, a movie night, a special guest lecturer, edible book festival) and the library wants to get the word out about it. It’s not a guarantee of higher attendance at the actual event, but such a post, when written in a personable tone, does alert patrons to the fact that the library is a dynamic place, not just a repository of materials in varying formats. Taking this type of post one step further, a library’s social media manager may want to consider sharing stories that come about from the event. Did the library debut a new gadget at the event? Did a quote from the lecturer stand out? Did the cake you ordered for your National Library Week celebration arrive with the library’s name misspelled – e.g., the “Othmer Library of Chemical History” became the “Other Library of Chemical History”? The fun moments, the serious moments, the quirky moments – all can have a place on social media, all are demonstrations of what patrons can take away from participating in a library event. 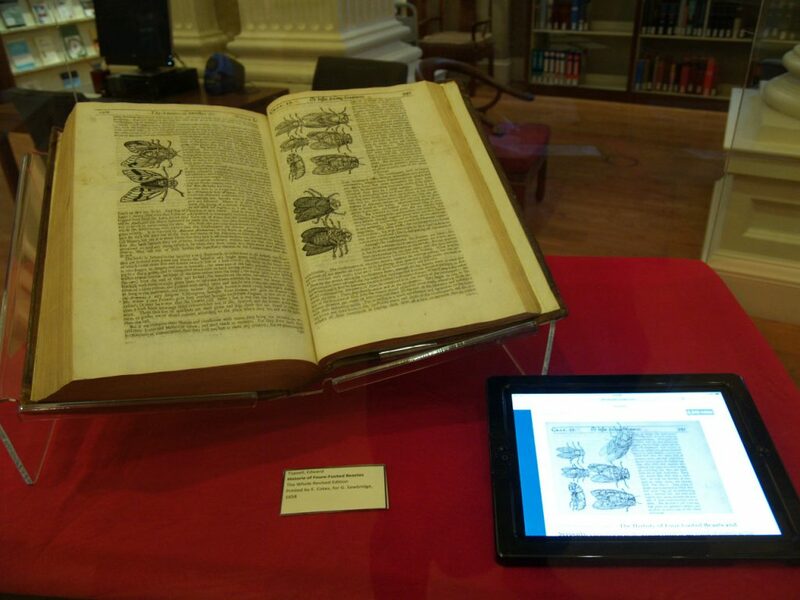 The History of Four Footed Beasts and Serpents (1658) on display at the 2015 Othmer Library Open House. 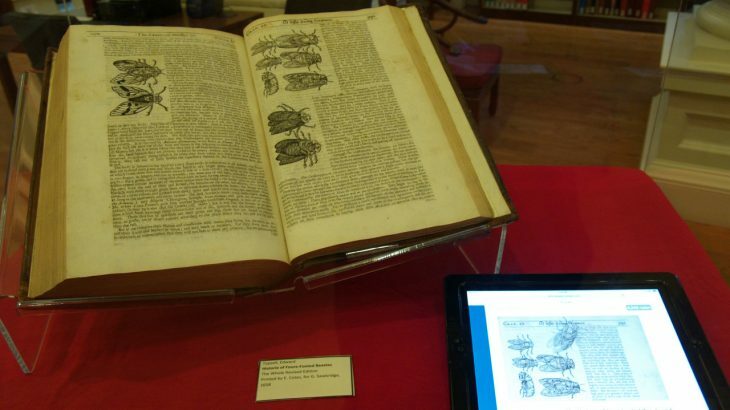 An iPad next to the book displays a GIF made from one of the book’s illustrations. Whether you are new to social media or an established presence on a platform(s), I hope the above suggestions have provided some creative inspiration for your library’s future content. Where do you look for social media content ideas? What types of content seem to do the best on your library’s social media? Share your thoughts in the comments below! General information, Original Content content planning, outreach, social media. permalink.